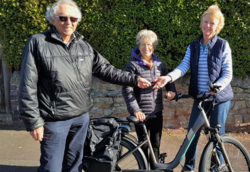 Ledbury has a new electric bike loan scheme. Its run by a small group of volunteers and one of them, Dilys Merry, tells us more. The idea is simple. We want to give people the chance to try out an e-bike, discover how good they are and see how using it can fit into their daily lives. We are offering the chance to borrow our e-bike for two weeks free of charge, during which time you can get used to it and find out how often you use it. We are helping people over the gap between thinking it’s a good idea and actually riding one, which might otherwise not happen if you find the initial outlay daunting. What’s it like to ride an e-bike for the first time? I was surprised at how easy it was and a lot simpler than I expected. For example, you have control over the power provided by the motor, by selecting anything from no assistance, to slight assistance, to full power. It really irons out the hills around Ledbury and makes cycling into wind a breeze (excuse the pun!) What this means is that if you haven’t cycled for a long time, or are not particularly fit, you can still cycle from A to B. Another thing that surprised me is the simplicity of recharging the battery – you simply remove it from the bike and plug it into a socket at home. What’s so good about an e-bike? They’re great fun to ride. Many converts reckon it actually improves their fitness as they get out on the bike more regularly and commuting to work by e-bike proves a big money-saver. On average it costs about 2p to recharge which is the equivalent of 1,000 mpg, and can be made even greener if you use renewable electricity for re-charging. Anyone who feels that cycling is just too energetic for shopping, getting to work, or enjoying our delightful Herefordshire country lanes should give electric bikes a try. How did the e-bike scheme come about? 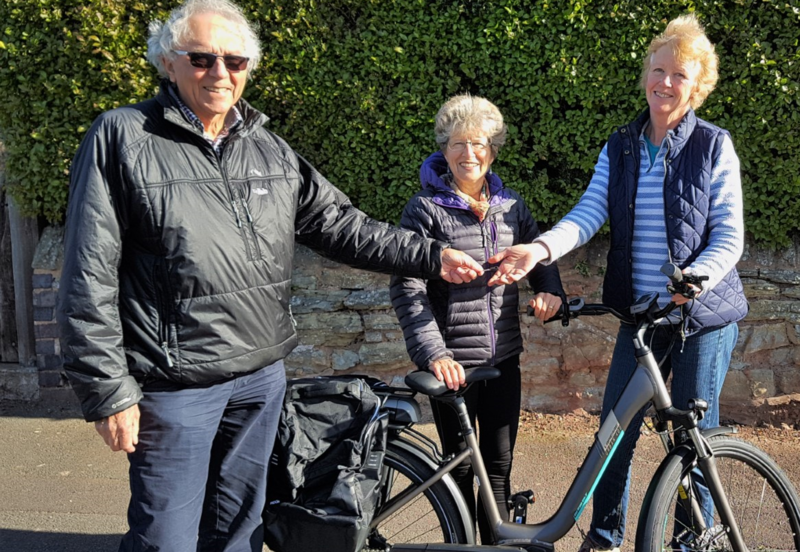 I’m a member of the local car sharing club run by Malvern Hills Car Clubs, one of many Transition Malvern Hills energy saving projects, including an e-bike loan scheme. The Ledbury Area Cycle Forum provided the impetus to extend the loan scheme to Ledbury. The bike was funded thanks to the Tesco ‘Bags of Help’ scheme running in our local store, together with help from Transition Malvern Hills. If you try the bike and like it, we offer advice to help you choose the e-bike that’s best for you. There is also a market in second-hand e-bikes that we have access to. Although I am already a keen cyclist, able to cycle up all the hills in the area without assistance, I was very interested and I plan to get an e-bike when I need it.